A day before Hurricane Sandy’s first anniversary, Mayor Bloomberg showed up at New York University flanked by aides, a congressional delegation and HUD Secretary Shaun Donovan, all of them there to announce a fresh infusion of $1.34 billion in federal funds to help rebuild homes, businesses and infrastructure damaged in New York City by its worst natural disaster. The U.S. Department of Housing and Urban Development had already provided the city with more than $1.7 billion earlier this year, a mere pittance compared to the enormity of Sandy’s devastation across five states on the Eastern seaboard. The mayor, of course, has been no slouch in drumming up disaster aid for Sandy-stricken residents, noting that some 47,000 families have been helped by city contractors working free of charge to get them back into their homes and apartments with the city’s federally funded Rapid Repairs initiative. The New York City Build It Back program drew some 23,000 to sign up by September. HUD’s money will reportedly be funneled into Build it Back as Community Development Building grants. Registration for applicants has been extended to October 31. The grants will also include more than $2 billion for New York State, with “significant benefits” for communities in the city, Donovan said. 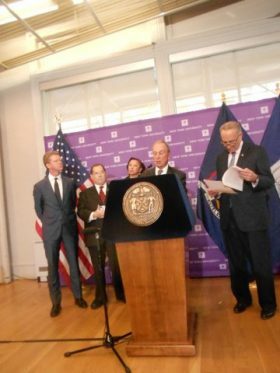 The HUD secretary, who once was the commissioner of New York City’s Department of Housing and Preservation in the Bloomberg administration, described Sandy’s anniversary as a “difficult” one marking a time when New York “experienced the most devastating storm in its history.” He noted that 650,000 homes were damaged or destroyed and 9 million customers lost power –“far more than Katrina,” but also pointed out that the federal government has already provided direct assistance to more than 230,000 people and small businesses through “grants, loans and other forms of assistance.” He said it was his belief that New York must provide “a model” for the rest of the country on the impact of climate change. Senator Chuck Schumer made it plain that this time around federal money will flow more rapidly to city sources than the first grants to New York after President Obama signed The Disaster Relief Appropriations Act of 2013 in February of this year. “When you set up new programs, it takes a little while but the second year will be a whole lot better,” he said. The Daily News reports that, as of yet, only one homeowner has actually received a payout from the city’s Build It Back program. HUD allocated the funds based on data from the Federal Emergency Management Agency, the U.S. Small Business Administration and other agencies, according to a prepared statement from the agency. It said grantees will be required to identify unmet needs and incorporate risk assessments in their planning, including the impact of climate change. Donovan said grantees in New York City and state must provide an action plan on “exactly how they plan to spend that money and we expect that in the next few weeks” for review. He expects to allocate more funds before the end of the year. During a question and answer period, B+B asked the officials about the plight of Knickerbocker Village, the venerable Lower East Side housing project on Monroe Street that was severely damaged by flood waters and still needs renovations. “Knickerbocker is a privately owned affordable housing development and is required to have insurance, so the first level of help is FEMA and the insurance,” said Cas Holloway, deputy mayor of operations. He also suggested a signup with Build It Back.